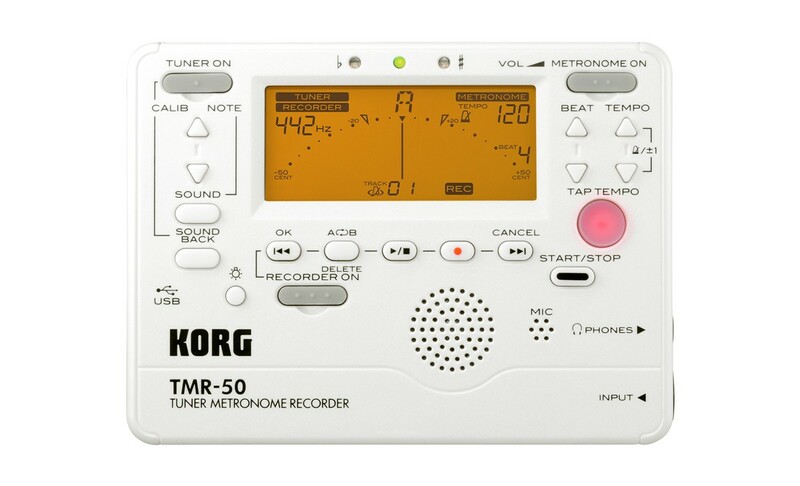 Korg’s popular TM series of tuner/metronome units is loved by players who practice to perfect their musical skills. 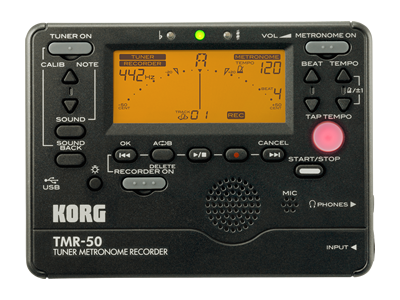 Now joining the lineup is the TMR-50, which adds recorder functionality to the already impressive list of features. An extremely valuable way to improve your playing ability is to identify the problem areas that need work, and then practice to improve those areas. With its built-in mic and speaker, the TMR-50 makes it easy to practice this way. It provides high-quality linear PCM recording and a USB port for convenient usage with your computer. The TMR-50 features equally robust capabilities for its tuner and metronome functionality that will help you improve your sense of pitch and rhythm. Two choices of color are available: black and pearl white. Whether you’re in a brass band or an orchestra, the TMR-50 is the ideal partner for anyone who wants to improve their playing. The Sound Back function generates the reference tone that’s closest to the input sound, while the meter indicates the pitch discrepancy between the reference and the input sound – a great function for ear training! Wide tempo range of 30-252 beats per minute. Since a mic and speaker are built-in to the TMR-50, you can start recording when the moment is right. Of course there is also an Input jack and a Phones jack, so you can record via a contact mic or play back the audio through earphones. There’s also a convenient Loop Play function that repeatedly plays the specified region of the recorded data, allowing you to practice along with a specific phrase. In addition, the tuner, metronome, and recorder can be used simultaneously for even more effective training. 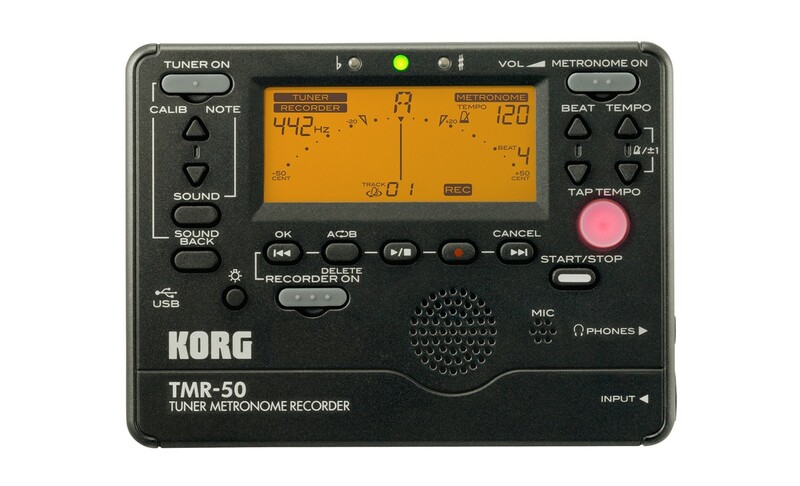 The TMR-50 can help you check your playing in a variety of ways that will help you advance as a musician; you can record with a metronome pre-count, record a “tempo sync track”* that lets you check whether you were in time with the tempo during playback, or you can activate the tuner during playback to check your pitch. *During recording, you’ll be able to monitor the metronome sound in real time through the Phones jack. In spite of its affordable price, the TMR-50 features high-quality linear PCM recording/playback (44.1 kHz / 16-bit, monaural). It’s also able to automatically optimize the recording level as appropriate for the volume of your playing, ensuring great clarity and excellent sound. A maximum of 100 tracks can be recorded (total time approximately 20 minutes), which provides ample space for recording instrumental practice. If the TMR-50’s recording memory fills up and you want to save data, you can copy it to your computer via the USB connection. The data is saved in WAV format, so you’ll be free to listen to your practice sessions on your computer whenever you want. Standard WAV format files can also be copied from your computer to the TMR-50 and they can be listened to through the built-in speaker or headphones*; for example, you may find it convenient to store the original recording of the song that you want to practice.